Photo: Caboose meat combo III, chicken infillay, beef alitcha, doro watt, zilzil tibbs, beg watt, with salad and “harvest veggie” (carrot, green bean, onion, and tomato), and gomen (collards). You’d never know it from the coffee shop/soup & sandwich decor, but Caboose Cafe in Del Ray serves Ethiopian food at dinner Monday through Saturday. We’ve been back quite a few times for this unpretentious but delicious food. They go easy on the spice for the Del Ray-eans, so we promise the waitress we can take the heat. 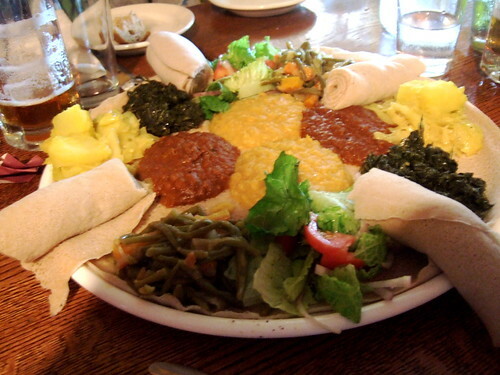 No raw kitfo, no tej, but a decent selection of dishes from the Ethiopian owners. I love the “harvest veggie” in the vegan platter. When I asked the waitress what the dish is called in Ethiopia, she didn’t know, but my Time-Life African Cooking from 1970 has a photo/recipe of something that seems very similar called yataklete kilkil (potatoes, carrots, beans, onions, etc.). Why not just call it that on the menu? They also sell bread (baguettes and rustic loaves) and they serve an ok soup and sandwich for lunch. Blah blah cafe stuff. Mancini’s down the street does a better breakfast. 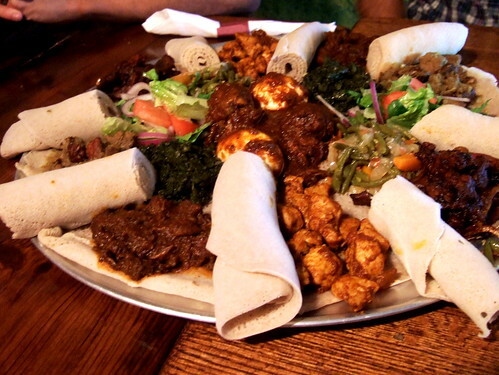 It’s the Ethiopian food that brings us back here. Photo: Vegan sampler, miser watt, gomen, cabbage, kik alitcha, and harvest veggie (aka yataklete kilkil?). Have you already told the waitress the name you found out? Maybe she would be interested in finding a name for the menu. Meat combo III for two people: $26.95, Vegan combo for two people, $19.95, two platters really serve five hungry adults. we hope to be able to enjoy all these wonderful places with you when we visit soon. I’d kill to have food like that in my dinky Yamanashi town. Yes, those pictures make me hungry too! I’ve eaten Ethiopian from Caboose many a time. So good to have them in the neighborhood!